Here you can control the layout of a page when printing via the browser menu, which you can reach in most browsers via the File menu. 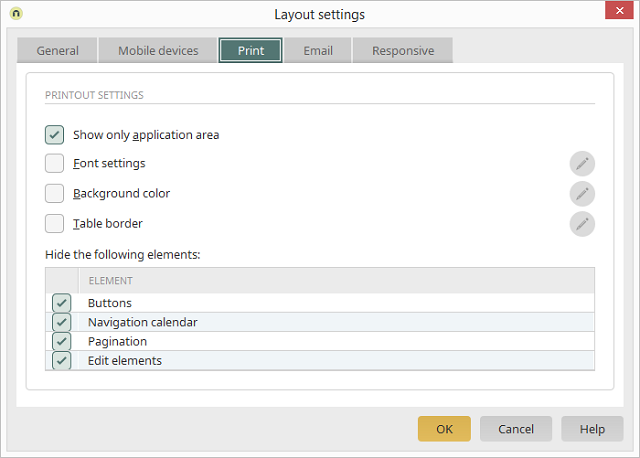 This setting has the effect of only displaying the elements that are contained in the application area when printing. If this setting is not applied, all other areas, including menus, additional controls, etc. will be printed out as well. With these settings, you can define which font, background color or table border should be used for the printout. Opens the respective dialog where the font, background color or table border can be defined. If individual elements should not be printed, please deactivate them in the lower area.